Statue of a Lion savaging a prisoner. Carved from Ferruginous sandstone (which is very hard) and dated to the middle of the 1st century BC. This classic pose demonstrates the power of the Kushite monarchy. The lion (representing the King) is all powerful, its paws are holding the helpless prisoner. The prisoner has his hands tied behind his back and also to the ankles, is wearing a short kilt and his head is being grasped in the lion's jaws. 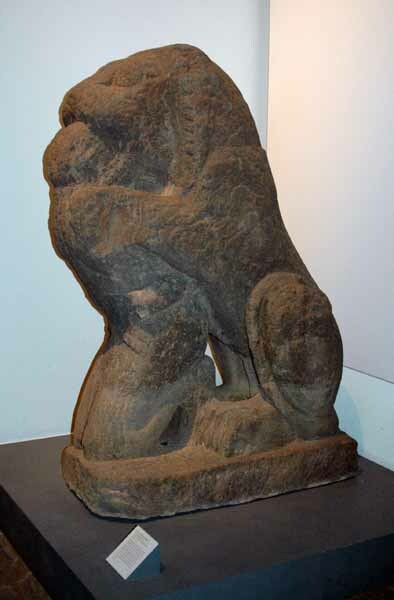 This statue was one of a pair of statues that flanked the temenos (entrance) of the precinct of the temple of Basa. The statues now guard the entrance to the National Museum in Khartoum. The town of Basa was 25 miles to the South West of Meroe.